One of the growing pains faced by the flourishing Japanese video game industry in the 1980s was increased scrutiny of copyright and trademark issues. In their domestic market, Japanese studios might have been able to casually appropriate popular Western characters without interference. But as games grew popular worldwide, lawyers on the other side of the Pacific were more liable to notice when, say, Sega’s ninja game The Revenge Of Shinobi slipped a flying demon Batman into one of its boss fights. 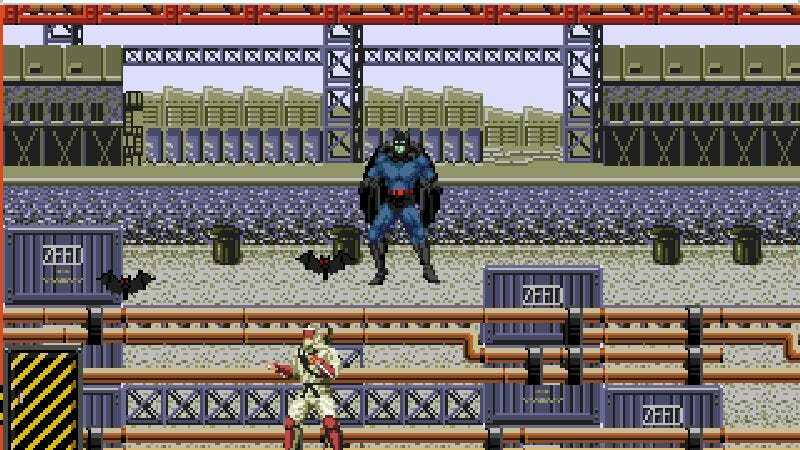 The first version of the game also includes characters who bear an unmistakable resemblance to Spider-Man (complete with web-slinging), Rambo, and Godzilla. Subsequent revisions reflect a scattered effort to make the game less of a lawsuit magnet. Version 1.01 of Revenge ditches Batman and shaves the Rambo character’s head to make him less Stallone-like. Version 1.02 revises the Spider-Man boss to make him look more like Spider-Man, as Sega had obtained an official license to the character. And version 1.03 replaces Godzilla with what appears to be Godzilla’s skeleton and innards. It’s as if Sega was playing a Revenge Of Shinobi meta-game, one in which the hero dodges subpoenas instead of bullets. Ripping off the likenesses of real celebrities is maybe the least anarchic thing that happens in Sega’s ancient arcade curio I’m Sorry. It’s a work of Japanese political satire, for starters—the main character is a caricature of disgraced Prime Minister Kakuei Tanaka, a man whose political career survived even after he was found guilty of bribery. Tanaka collects gold bars in this game—the satire isn’t terribly subtle—and the “enemies” that try to stop him are some of the most beloved icons of the era. Michael Jackson is definitely moonwalking in there, and other characters bear suspicious likeness to Olympian Carl Lewis, Japanese wrestling legend Giant Baba, and Madonna. Perhaps all of this unlicensed star power made Sega think a game about a Japanese politics could fly in Western arcades: Strangely, the game was localized for a U.S. release, although it’s hard to find evidence that the English-language version ever showed up in American arcades. When it comes to gleeful pop-culture appropriation, Mother 2, as the role-playing game EarthBound was called in Japan, doesn’t hold back. The Blues Brothers are in there (as the Runaway Five), there’s a yellow-submarine-load of Beatles nods, and some of the original music samples bits and pieces of copyrighted songs, like the Our Gang theme, “Good Old Days.” Its Japan-only forebear, Mother, isn’t so rife with references, but it has one character who has been fully lifted, name and all. Early in Mother, the young hero, Ninten, learns about a girl named Pippi Lindgren who has gone missing. Pippi is a lot like another famous Pippi—Longstocking, that is—who had been around for more than 40 years at the time of Mother’s release. Both Pippis have red hair and gravity-defying pigtails. And they both have strength that would be impressive for any human being, let alone a little girl. To top it all off, the last name of Mother’s Pippi is borrowed from the author of the original Pippi Longstocking books, Astrid Lindgren. That’s not intellectual property infringement. This is intellectual property infringement! Konami established a generation of fans by creatively appropriating pop-culture icons in its late-’80s NES games. Castlevania developed a distinct flavor over the years, but it began as an excuse to whip the Universal Monsters pantheon in the face, while Contra slapped ersatz Stallone and Schwarzenegger right on the cover (alongside an H.R. Giger-esque alien) and called it a day. Those classics ripped off the greats, so they endured over the years. Konami’s Bayou Billy, meanwhile, drew its “inspiration” from a paragon of ’80s mediocrity: Crocodile Dundee. Billy sports Dundee’s leather vest and bowie knife; the only accoutrements he’s missing are the teeth that Paul Hogan has on his hat. There’s even a giant croc sitting right there on the game box, just in case the rest of the image didn’t already drive the connection home. Also like Dundee, Billy is a survivalist, but he lives out in the swamps of Louisiana rather than in the Australian wilderness. In fairness to Billy, he’s much more proactive in his community than Dundee, constantly fighting criminals like old Godfather Gordon of Bourbon Street. Martin Jay Sadoff had no idea that his love of hockey would accidentally create one of pop culture’s enduring horror icons. The special effects artists just happened to have a bag of hockey gear with him when production on Friday The 13th Part III was underway and the crew needed a mask for the film’s supernatural slasher, Jason Voorhees. The hockey-mask look has been reused for countless enemies (and even badass power-ups) in video games since then, from Ninja Gaiden to Kid Chameleon. But no game’s Jason Voorhees ripoff was quite so brazen as Rick Taylor, the protagonist of Splatterhouse. This 1988 brawler was a novelty that aped the campy, gory horror flicks of the era that Friday The 13th exemplified. Blood gushes, monsters squirm, and Rick can bash monsters into pulp against a wall. Most everything in the game is only vaguely referential, but not so with Rick. He wears the same puke-green overalls as Voorhees in addition to the signature hockey mask—or a “hell mask,” as Splatterhouse calls it. Splatterhouse: Wanpaku Graffiti, a goofball Japan-only NES spinoff, was even more shameless. It features a graveyard fight against fake Michael Jackson that’s backed by the melody from “Thriller,” an enemy based on Regan from The Exorcist, the face huggers from Alien, and fly-spewing teleporters borrowed from David Cronenberg’s The Fly. While the villain of Nintendo’s first smash-hit game wasn’t exactly a ripoff of King Kong, it was indirectly inspired by the cinematic ape, and as such Donkey Kong became the subject of a landmark lawsuit of the arcade era. MCA Universal, wanting a cut of Nintendo’s lucrative Kong income, sued Nintendo for trademark infringement in the hope that the Japanese company would pay a royalty for the King Kong likeness. (Indeed, when MCA went after Coleco, which published a port of Donkey Kong for its ColecoVision console, Coleco’s lawyers caved and agreed to a licensing deal.) But in a gutsy move, Nintendo let the case go to court, where its legal team argued not only that Donkey Kong failed to infringe on King Kong but also that the King Kong character was probably in the public domain—that is, MCA didn’t even have rights to the intellectual property that Nintendo was supposedly stealing. A district court judge sided with Nintendo, a decision that held up on appeal.